“Gower Holidays” for a friendly, honest and reliable service. Firstly, Gower Holidays is NOT an agency. We take no commission on bookings, we simply charge a yearly fixed fee for advertising. Every advert on the site has a Stage 1 listing advert and live examples of these can be seen on the accommodation pages. A live example of a full Stage 2 advert can be found here. Stage 2 page– which gives really comprehensive coverage of your property. a feature header photo of the exterior or interior of the property. your property name and contact details below and the ‘Share’ symbol to easily enable the page to be shared. as much textual write up as you like; giving you plenty of room to expand. If you add a Special Offer onto the system, the details will appear on this page, as well as the Stage 1 advert being marked as a Special offer and the advert appearing in a list of Special Offers accessed from the main menu. More details which are also search criteria are shown on the right. up to eight reviews from your guestbook (with attributions if you prefer) to inspire customer confidence. People love to be able to walk around inside a property and imagine staying there themselves. Include a video guiding them around and if you’re good on narration, then you can point out all the features that will clinch the booking. So that your potential clients know exactly where you are in relation to the beach, the pub or whatever else they’re looking for, include your property on a Google map. Every property has a unique selling point for location. What’s yours? All on one page… your calendar showing your vacancies and bookings and your price list. Price comments are on there too. e.g. dogs at £15 per dog per week. It is essential now, more than ever to display your prices. Many people looking disregard a property that asks them to ‘enquire for further information’. The price list has up to 3 columns and you can add as many rows as you want. This allows for flexibility across accommodation providers. You select your own column headings and the details within the rows (not just prices, you can put explanatory text in there too). You can display a week by week price list or a low, mid and high season pricelist or show how much it costs for 7 days or 3 days etc. etc. The columns will arrange themselves tidily on the screen. Enquiries are directed to you through an enquiry form, which captures the information that you need to progress the enquiry. If you’re on social media, tell the people who are looking at your advert and encourage them to follow you. Finally Stage 3 is web address registration and redirection. Simulate having your own website by purchasing a web address and pointing it at your Stage 2 page. This shortened web address is perfect to make the most of your Stage 2 advert and a very cheap way of having your own web presence without incurring the overheads of a standalone commercial website. The web address can be quoted in correspondence, within adverts, on business cards and given to phone enquirers, directing them to the one place where they can find much more information about your property. e.g. 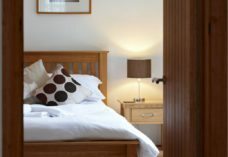 www.faircroftgower.co.uk is the web address which we have registered for the property Faircroft and it points at https://www.gowerholidays.com/accommodation/self-catering/faircroft/which is the Stage 2 page for Faircroft. For the answers to any further questions or for our pricelist, please contact us.